I read this article in the Sunday Times about five years ago and thought it was worth quoting. The original author, Judith Ancer is a Johannesburg based psychologist. The list is posted in this blog post with permission from Judith. Here she has come up with ten very meaningful ideas as "gifts" to your child or children. 1. The gift of optimism. 2. The gift of compassion. 3. The gift of courage. 4. The gift of humour. 5. The gift of community and connectedness to our families; friends and communities, whether they be the school community or other communities to which the child might belong. 6. The gift of competence. Starting at a young age with household chores, tidying up and even cooking. 7. The gift of conviction - finding meaning in faith, other people or even in the future. 8. The gift of curiosity. 9. The gift of creativity. 10. The gift of perspective and common sense. All valuable gifts, I am sure you will agree. Judith Ancer elaborated on each one. I have chosen to leave her comments out giving you, the parent food for thought. These are gifts for a life time and can all be passed on. 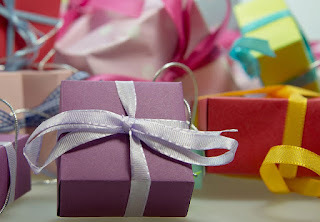 I would really enjoy receiving any additional "gift" ideas, if you would care to share them.